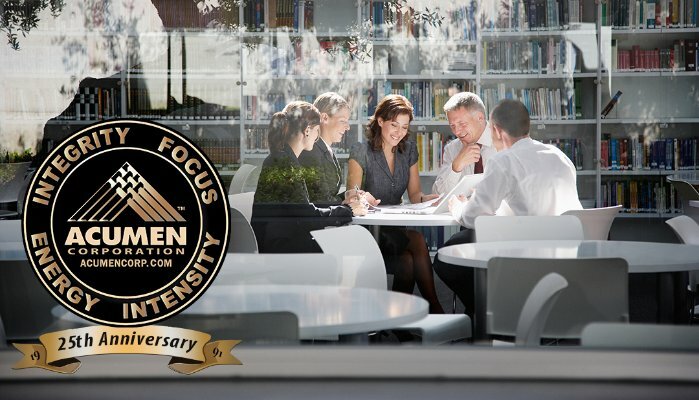 With this posting I’m officially kicking off our celebration of 25 years in business here at ACUMEN Corporation. Quite frankly I think I had lost track of the passage of that much time, given that the work is so fulfilling. From a personal standpoint I have had the pleasure of working with some of the finest information systems and business consulting professionals in the world. Our recruiting process is rigorous but it yields a group of highly motivated and skilled individuals who carry on our commitment to client centricity. And I can’t say enough about the wonderful clients we have served during that period. From our first large contract with the great folks at Murry’s Inc. (the steak people in Washington, DC) to our many distributors, manufacturers and service organizations across the country, we are proud of your acceptance of and loyalty to our company. Recently I sat down and made a list of some of the notable milestones from the first 25 years. Here are just a few. Several of our associates finished their advanced degrees (even one PhD!) while in our employ, something in which we share pride. We now have four retirees and they often visit with us to remember and share old war stories. I’m very proud to say that some of our alumni have gone on to careers in management elsewhere (with our good wishes and blessing) and still return for visits as members of the family. On the less pleasant side, we lost two of our own to cancer. That is two too many funerals. We must do something to eradicate that awful disease. …and perhaps our proudest moments came in support of charities large and small. We did it as a team, including participation in 5K walks and other fund raising activities over the years. For the past two years we have sponsored a golf tournament and coordinated other activities in support of our veterans that raised several thousand dollars for rehab and reintegration into society and the workforce. I love my team for that. So obviously I’m a proud CEO. Thanks to all team members present and past, to all of our clients and a special thank you to my visionary partner Sandra Dube for helping me chart the course. On the occasion of our 25th year the most important voices, as always, come from our clients. I invite you to view a short video featuring some of the best. Thank you all!